SOCIAL-ENTREPRENEURSHIP TOURS, INVESTMENTS & DEVELOPMENT. 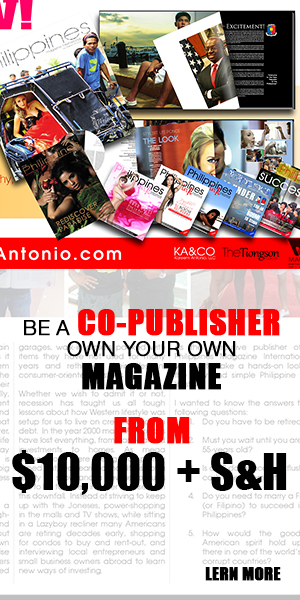 MAGAZINES, MEDIA, PRESS, RADIO, TV & INTERACTIVE EVENTS. Double your revenues, diversify your clientele, look great on-line, attract foreign clientele, raise standards and motivate your workers? Get The Word Out! The KA&CO Press Release Booster Promo Pack. Includes: Limited Research, 500 Words, T.A.P.S. Am Press Site Upload, SEO, Facebook & Global Distribution. KAREEM JACKSON LIVE! ON THE SET SUBSCRIBE NOW! LIVE! ON-THE-SET REAL PHILIPPINES. TRUE-LIFESTYLE. NO PROPAGANDA. Welcome to the official Kareem Jackson LIVE! ON-THE-SET Channel on YouTube! Want to see what's going on in Kareem's world? Want to join along on more than 100 PROMOTIONAL TOURS in the Philippines? Marketing Success 101, INFO TECH 101, English 101, American-Standards 101 and OUTSOURCING Success 101 are all designed to take you to THE NEXT LEVEL. Great for Entrepreneurs, Colleges, Companies, and Professionals who need specific real-life curriculums to help them to achieve their goals. Promote Your City, Product, Service, Event or Country Internationally. Build Credibility, Awareness & Make Money Doing It!